Choose from the following sights and attractions your personal favourites. The Vienna Flexi PASS is transferable. 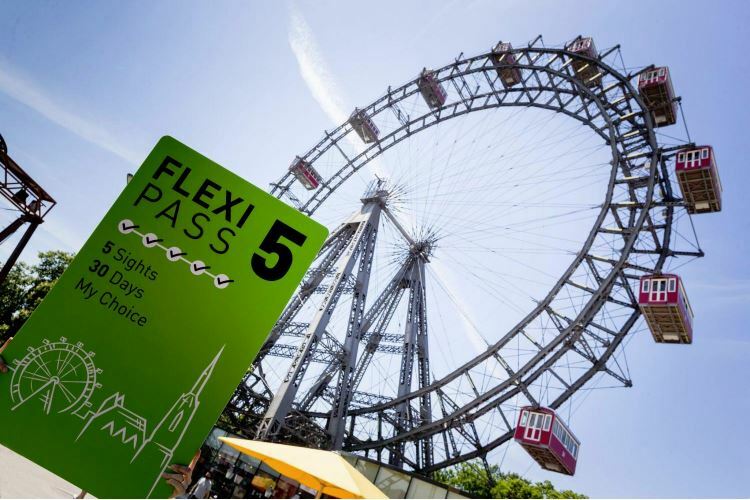 Children under the age of 6 have free admission to the selected sights when accompanied by an adult Vienna Flexi PASS holder. Children between 6 and 18 (included) qualify for a Junior Vienna Flexi PASS with a 50% reduction. Belvedere Palace, Imperial Treasury, Mozarthaus or a bus tour through the city: visitors to Vienna are spoilt for choice when it comes to sightseeing. Here you find more information on all Vienna Flexi PASS attractions. Take your time and choose your personal 3, 4 or 5 favourites. The world’s oldest zoo with its over 700 species of animals is part of the Schönbrunn Palace Gardens and has been named Europe‘s best zoo three times running. The Danube Tower is Vienna’s tallest attraction and was constructed in 1964 for the Viennese International Horticultural Show. Enjoy a breath-taking view of Vienna and the Vienna Woods! The Leopold Museum is the most popular museum in the MuseumsQuartier cultural complex. It houses the world’s largest Egon Schiele collection as well as masterpieces by Secession founder Gustav Klimt. The collection of the Museum of Natural History includes such famous objects as the 29,500-year-old “Venus of Willendorf” figurine and the largest and oldest meteorite collection in the world. Kandinsky, Paul Klee, Pablo Picasso and Alberto Giacometti as well as masterpieces of Pop Art by Andy Warhol and Roy Lichtenstein. The Morning Exercise offers an insight into the years of training of the Lippizaner horses and their riders. The summer programme “Piber meets Vienna” offers visitors insights into life at the Piber stud. The House of Music is an interactive experience that opens up new and surprising perspectives on music and sound, and provides an overview of the history and tradition of Viennese music. The former residence of Prince Eugene of Savoy is home to the world’s largest collection of Gustav Klimt’s paintings, as well as masterpieces by Schiele, Kokoschka, Waldmüller, Renoir, Monet and Van Gogh. HAUS WIEN houses the world’s biggest collection of his works. It also shows international photography exhibitions of renowned artists. The Vienna Giant Ferris Wheel has been turning since 1897, affording a unique view of the city on the Danube. It is visible from afar as an unmistakable landmark for the Viennese and for visitors alike. The HOP ON HOP OFF bus tour is the fastest way to get an overview of Vienna‘s major sights. The buses are modern and comfortable and provide a perfect view of the city. Get on and off at any of the stops as often as you wish. A free guided walking tour is included in your ticket. Enjoy fun and adventure at Prater! 5D Kino, Vienna Flight, Laser Spy and Walk of Stars offer fun and action for young and old alike. Beethoven’s first major composition in this house was the opera “Leonore”, which was later renamed “Fidelio” against his will. Here, you can admire a series of of the composer’s personal items. Joseph Haydn (1732-1809) moved into his house in Gumpendorf in 1797, aged 65. It was there that he passed away on 31 May 1809. Make sure to visit the garden as well, which has been reconstructed based on historical models. In this apartment in 1867, Johann Strauss composed the world-famous waltz “The Blue Danube”, Austria‘s “unofficial anthem”. He lived in Praterstraße, which at the time was a fashionable and elegant suburban street, for seven years. The exhibitions of the Jewish Museum Vienna at Palais Eskeles focus on Jewish religion, tradition and Jewish history in Austria. At the Museum Judenplatz, you can see the excavations of the city’s medieval synagogue. The Imperial Crypt (also known as Capuchin Crypt) is the burial place of the emperors and empresses of the House of Habsburg and their families. 146 people have found their final resting place there. The Imperial Treasury Vienna in the Hofburg Palace houses unique Habsburg treasures, among them the Austrian Imperial Crown and the Imperial Regalia of the Holy Roman Empire with the crown and the Holy Lance. The Madhouse Tower is an important monument of late 18th century medical history. Since 1971, it has been home to the Collection of Anatomical Pathology. Since its founding in 1923, the Vienna Porcelain Manufactory has been located in a former imperial palace in the Augarten park. The museum illustrates the history of Viennese porcelain with over 150 representative pieces from its different artistic phases. The State Hall of the Austrian National Library is one of the world‘s most beautiful historic libraries. Habsburg Emperor Charles VI (1685-1740) had this gem of secular Baroque architecture built for his court library. Walk through the impressive 300-year-old cellar vaults, shake bottles on the wooden riddling racks and discover the secrets of “disgorging”, “dosage”, and the “cellar mark”. At the end of the tour, you will have the opportunity to taste the fine products of Schlumberger. Franz Schubert was born in this house on 31 January 1797 and lived here for the first four and a half years of his life. In addition to contemporary portraits of the composer, you can see his perhaps most widely recognised trademark: his spectacles! During the last weeks before his death in November 1828, Franz Schubert lived in his brother Ferdinand’s apartment on Kettenbrückengasse near Naschmarkt. Here you can see his last drafted compositions. In the house where Sigmund Freud lived and practiced, the Sigmund Freud Museum presents an exhibition documenting the life and work of the founder of psychoanalysis. Discover the different faces of the Klosterneuburg Monastery on one of its tours. Choose one of the following themes: Sacral Tour, Imperial Tour, Wine Cellar Tour, Treasury Tour or Museum Tour. Discover authentic desert landscapes from Central America to Madagascar in the Desert House Schönbrunn and you unique animals.